Includes important co-factors: The vitamins come with live probiotics, amino acids and other co-factors, which enhance the absorption of the vitamins. Enzyme blend: Comes with enzymes which aid the digestive process. High-quality manufacturing: The multivitamins are certified by NSF International. Not derived from real food: The New Chapter nutrients are not extracted from real food. The manufacturer simply converts conventional vitamins into a more "natural" form through a culturing process involving yeast. Not organic: The blend of organic fruits and vegetables represents a less than 5% of the total volume of each capsule. 95% of the ingredients are not organic. 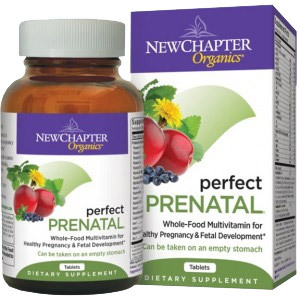 With an Effectiveness Score of 8.9 on a 10 point scale, the Perfect Prenatal multivitamin by New Chapter ranks number 3 out of the 106 multivitamins we have evaluated. Based on our analysis, we believe that currently this is one of the top prenatal multivitamin on the market. Our only additional advice is to supplement this product with extra Omega-3 and Calcium supplements in order to obtain all critical nutrients your baby requires. How does the New Chapter Perfect Prenatal Multivitamin compare with other brands in this category? MultivitaminGuide.org offers comparison between the New Chapter Perfect Prenatal Multivitamin and of all major vitamin supplements available on the market. Some of the unique aspects of this guide include comparison of the New Chapter Perfect Prenatal Multivitamin with 100 other vitamin supplement products, including popular brands such as One-A-Day, GNC, Equate, Kirkland, Shaklee, Nature Made, NOW Foods, Melaleuca, Puritan’s Pride, Herbalife, TwinLab, and Walgreens. The table below provides a summary of the Effectiveness Scores of some of the more popular vitamin supplement brands available on the market, including the New Chapter Perfect Prenatal Multivitamin.